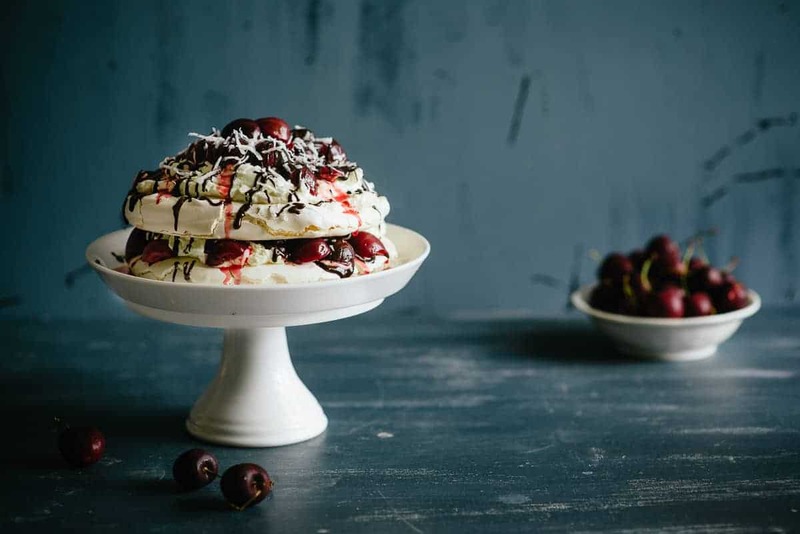 Cherry chocolate pavlova is a great way to celebrate this Australia day. I couldn’t think of better way to celebrate Australia Day than with a slice of pavlova! This cherry chocolate pavlova takes inspiration from that other iconic Australian chocolate bar, the Cherry Ripe. It’s a layered pavlova, that consists of whipped cream, chocolate sauce, poached cherries and raw, shredded coconut. If you don’t feel like stuffing about with egg whites and the whole process you can always make my gluten free lamingtons. I’m currently doing a number of recipes and photography for Westfield so I’ll be linking to those in the near future. All the best and if you’re in Australia, enjoy the day! Combine the cherries, icing sugar, lime juice and water in a bowl. Stir to combine and set aside for half an hour. Drain the liquid from the cherries and pour in a saucepan over a medium heat. Add the corn flour and Chambord liqueur and whisk to combine. Allow the mixture to come to a boil, lower the heat and allow to thicken – approx. 5 minutes. Add the cherries to the sauce, stir and set aside to cool completely. In a stand mixer combine the cream with the vanilla and beat until thick. Cover and place in the fridge until ready to decorate the pavlova. Preheat your oven to 200 deg C. On two pieces of baking paper draw the outline of an 18cm circle. Turn the papers over and place on two baking trays respectively. Beat the egg whites on a medium speed until stiff peaks form, add the icing sugar and continue to beat until the mixture is thick and glossy. This should take approx.. 10 minutes in total. Add the vinegar and corn flour and fold through the meringue. Spoon the meringue on to the two outlined circles on the baking paper, creating a disc shape ensuring there is a little height. Place the two trays into the oven and drop the temperature to 120 deg C (not fan forced). Cook for 45 mins in total, swapping the trays over half way through. Once cooked the pavlovas should feel firm. Allow them to cool in the oven completely before using. Melt the chocolate in the microwave in 1 min increments. Once melted stir through the coconut oil and set aside. To construct the pavlova, take one disc and place on a plate. Spoon over half the cream, followed by half the cherry sauce. Drizzle with the chocolate sauce and half the shredded coconut. Repeat for the top layer, set the plate on a cake stand and serve immediately.